This consultation is specific for getting the best possible SMILE for you. Here we look at all the options possible for designing your new smile. Here we look at all your teeth (back and front) for typical dental problems like tooth decay and other restorative issues. 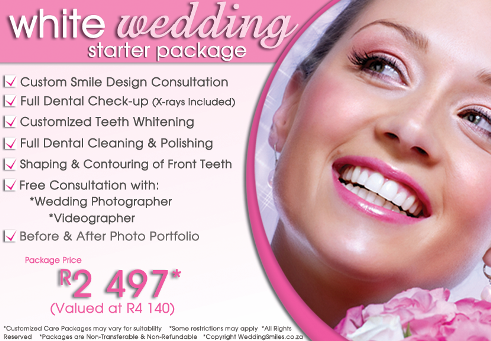 A white smile is crucial for any bride & Groom and with our top of the range products you'll have a truly White Wedding! We will also ensure that your teeth are sparkle clean with this Dental Hygiene appointment. Sometimes it only takes a little shaping and polishing of your front teeth to create awesome results! If you haven't book your Photographer yet, we can help. You will receive a change to meet our wedding Photographer and get all your questions answered. Entitled to special discount of R500. A video or DVD of your wedding is a must! You will receive a FREE Consultation with our Videographer and qualify for special discounts. We will also provide you with a series of before and after photos of your treatments. Please note that if you do have medical aid, you might also claim back services that your medical aid covers, example: Dental Check up & Cleaning.